The plan, unveiled on Sunday, would mean prisoners could be forced to make training tools for soldiers, including sandbags, fence posts and other non-lethal equipment. According to Justice Secretary Chris Grayling, the program will also provide prisoners with real life skills to help them once they are released. A trial of the program is currently taking place in HMP Coldingley, where a 10 year ‘Service Level Agreement’ (SLA) was signed, extending the program to other prisons. “During times of austerity we’re always looking at ways to be more efficient and this is a fantastic initiative,” said Minister for Defence Equipment, Support & Technology Phillip Dunne. While the program is a first for the UK, other countries have adopted similar schemes into their prisons. In the United States, the government has awarded contracts to the Federal Prison Industries company – worth nearly $20 million – to build body armor for US soldiers, according to a 2011 report from Wired magazine. Grayling commended the UK’s effort as a means of changing the way prisoners are rehabilitated. “For too long we have released prisoners back onto the streets with £46 in their pockets and little else than the hope that they would sort themselves out. It's little wonder things haven't improved – but now all this will change,” he said. Grayling also noted the government had saved nearly £500,000 during the trial at Coldingley prison, which began six months ago. The initiative comes as the Ministry of Justice (MoJ) prepares to supply additional rehabilitation services for prisoners, including support for combatting drug and alcohol abuse, as well as helping prisoners resettle once they complete their sentences. According to official MoJ figures, around 86,000 crimes were committed by former prisoners reoffending in less than a year since 2012. The figures also showed there were more than 600 ‘violent’ offences committed by former prisoners within one month of their release. Some have praised the new initiative, arguing that it could help prisoners by getting them out of overcrowded cells, but warned that the programme could fail with continued cuts to front end prison staff. "Speaking as an ex-prisoner I welcome any initiative to provide paid work in our overcrowded prisons where the alternative can be 22 or 23 hours locked in a tiny cell accommodating two or three men. In fact, most inmates do want to work, even if the weekly 'wage' can be as low as £8,"Alex Cavendish, a prisons and security journalist told RT. 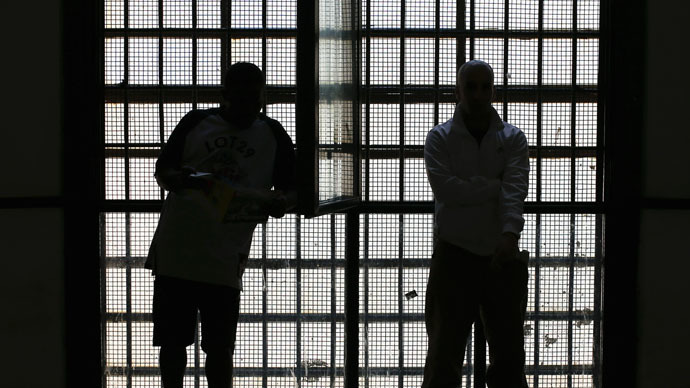 "My main concern is that any strategy designed to get more prisoners into work each day will be destined to fail until and unless there are sufficient front-line staff on duty to provide escorts and supervision in workshops." “Slave labor for the British war machine. Prisons as workhouses,” tweeted Jon Bigger.